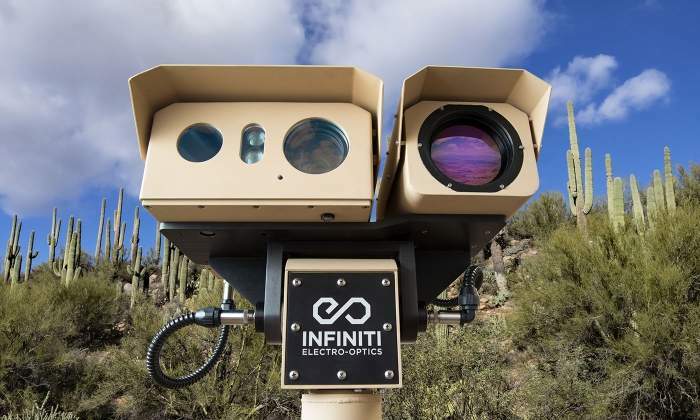 Infiniti Electro-Optics provides long-range thermal imaging (LRTI), advanced electro-optics (EO) and infrared (IR) video surveillance technologies in highly versatile configurations for 24/7 day / night detection, recognition and identification (DRI). The company is an expert in thermal imaging, ZLID (zoom laser IR) illumination, high-definition long-range visible and near-infrared (NIR) imaging, gyro stabilisation, shortwave infrared (SWIR) imaging and radar integration. Infiniti excels at using its experience and expertise to configure customised surveillance configurations ideal for your specific scenario, with field-proven experience in fixed installations, mobile solutions and marine deployments. Infiniti’s mid-wave infrared (MWIR) cooled thermal sensors let you see further than any other night vision technology. Capable of up to 50km (30 miles) of target detection in complete darkness when paired with its 1,400mm germanium zoom lens, the company’s top configuration offers 50% more pixels on target than the FLIR HDC-1200 or L3 WALRSS HD 1200 systems. Its MCT and InSb cyrocooled infrared sensors are available with either standard definition (SD) 640×480 or high-definition (HD) 1280 × 1024 resolutions. Unlike visible CCD or CMOS cameras, thermal cameras use heat rather than light to see an object. Humans, animals, and vehicles are very hot in contrast to most backgrounds, making targets easily detectable at long ranges even in bushes. Thermal imaging is also unaffected by bright light and has the ability to see through atmospheric conditions such as smoke, smog, dust and light fog. This makes Infiniti’s thermal infrared cameras the ideal technology for 24/7 long-range day / night surveillance. Infiniti also has a complete line of uncooled long wave infrared (LWIR) cameras that require no maintenance, are ITAR free, and offer up to 20km of vehicle detection. These systems use 17μm GEN2 VOx microbolometers with large aperture fixed or zoom germanium lens options ranging from 9mm to 280mm, and will include 10μm and HD resolution sensor options by the end of 2017. Infiniti Optics also has a wide variety of high-precision continuous zoom, fixed and dual-FOV optics for visible, NIR and SWIR imaging. These can be configured with integrated spectral filters to compensate for parasitic light conditions such as fog, smoke, haze, heat-waves, UV and IR. All of this works to optimise image clarity and resolution in ultra long-range surveillance imaging. With continuous zoom telephoto optics and options ranging from 180° panoramic views down to a 0.06° HFOV using our 5,500mm telephoto optics, Infiniti offers a range of options. Our 16mm to 2,050mm 128X zoom lens on our 1/2.8in HD sensor has integrated auto focus and also has the zoom field-of-view equivalent to a 13,500mm lens on a full-frame DSLR. Whether you need to detect potential threats at night or identify faces or licence plates at long range, Infiniti can offer ideal solutions for any application. With complete solutions that cover the visible, near infrared and thermal imaging spectrums, Infiniti combines these technologies into turn-key PTZ camera systems. These multi-spectral solutions offer long range detection, recognition and identification capabilities that overcome the many limitations of traditional CCTV and thermal camera systems. Infiniti’s high-end camera systems utilise state-of-the-art pan-tilt units with zero backlash and 0.00026° resolution. The 360° gyro-stabilised pan tilt accurately points and positions the visible and thermal infrared payloads and is custom-built and designed for mobile, land and marine applications, meeting and exceeding MIL-810-STD standards for shock vibration and extreme weather environments. Our quick clip tool-free system allows for in-field replacement of payloads and provides the ability to change payloads based on the mission profile while still maintaining IP67 and nitrogen pressurised environmental protection. 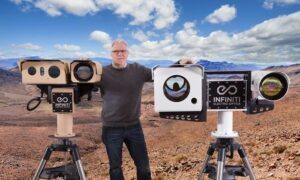 Infiniti does not simply sell products, it designs complete end-to-end EO / IR camera solutions that reflect the application and requirements of their clients. The custom-built systems are optimised based on budget limitation and performance criteria to provide industry leading ROI and performance. For example, the Viper PTZ system is designed to use a cooled thermal camera to detect targets and provide constant situational awareness, and when a target is detected, the HD visible / NIR camera can be zoomed in to recognise and identify the target. Zoom Laser IR Diode (ZLID) illumination allows the visible camera to see even in complete darkness for 24/7 threat detection, recognition and identification. Optional LRF and video tracking analytics can be used to auto track and plot target locations. All of these sensors are integrated on a military-grade gyro-stabilised pan / tilt and can be further integrated with radar, C2 and VMS software for complete automated threat detection and identification. Infiniti Optics has a long history and track record and has been utilised for military, defence, marine and critical infrastructure projects worldwide. Infiniti boasts a large variety of end users, from corporations such as Shell and Pfizer to regional ministries of defence, navies and special forces in the US, Canada, Middle East and South East Asia. They are a vendor to the top US defence contractors. 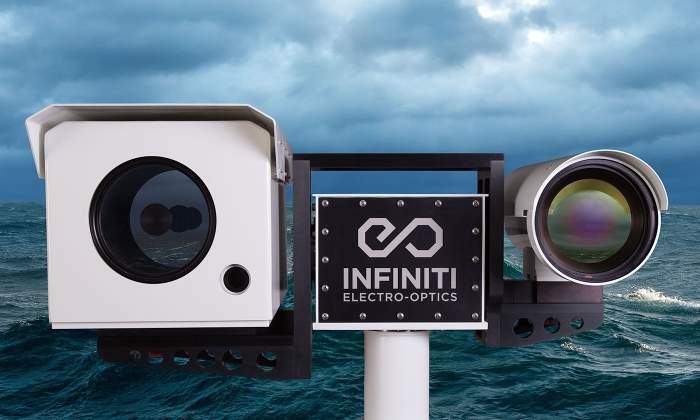 Infiniti’s EO / IR camera systems are designed to offer continuous operation in even the most extreme environments and climate conditions, and have seen long-term deployment in desert, marine, jungle and arctic conditions. 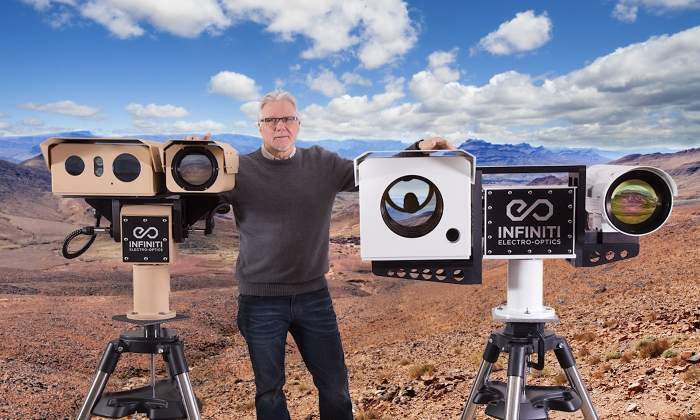 Infiniti Electro-Optics is a division of Ascendent Technology Group, which manufactures CCTV and IP surveillance cameras, VMS video management software headquartered in Canada. In 2007 Ascendent created ZLID technology, which was one of the first long-range IR laser illumination systems and offered a turnkey PTZ system in 2008 with the first HD laser system in 2010. Growth and demand for long-range EO / IR cameras led Ascendent to realise the necessity of a focused division specifically dedicated to the research and development (R&D), support and production of advanced long-range electro-optics and from this, Infiniti Electro-Optics was created. Infiniti Electro-Optics strives to remain an industry leader in the defence and surveillance market by creating customised solutions that exceed the performance of competitors while still being competitive. Infiniti prides itself on being a complete turnkey solution provider that creates solutions based on customer requirements rather than just products. 'How far can your cameras see?' is a request we receive daily. The problem with this question is that it requires more information in order to provide a useful answer. To help explain, here is the 'technically correct' (but not very helpful) answer to how far our cameras can see: Over 150 million kilometers.